Ridiculously easy! 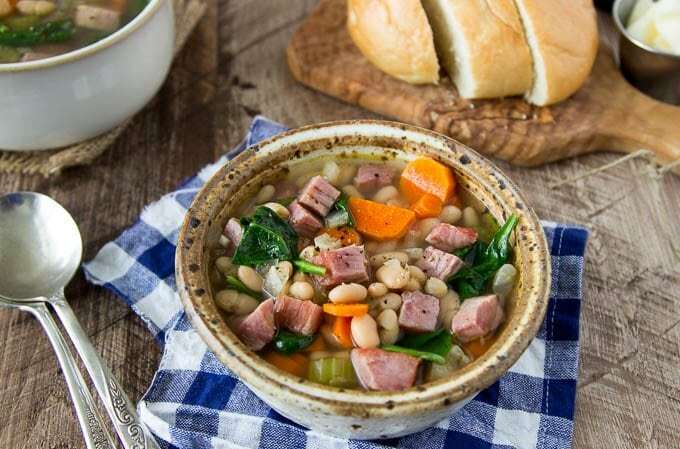 This One Pot Ham & Bean soup is hearty and chock full of favorites like chunks of ham, white beans, carrots, celery and a bit of spinach for some extra veggie power. Whip up a quick meal in about 30 mins. Perfect for leftover holiday ham or indulge your ham craving anytime of the year with store-bought ham (like black forest from the deli counter at your local grocery store). Snow! I’m dreaming of it! There is something so clean and serene about snow. I just want to breathe in deeply and let the cold air fill my lungs, look around at the pristine white powdery snow , maybe put on my snowshoes and go for a stroll through the pines…and come back to a roaring fire and a hearty warm meal. Mother nature is cooperating, the mountains around Seattle are getting a ton of fresh snow….soon…soon I’ll get a chance play in the snow! 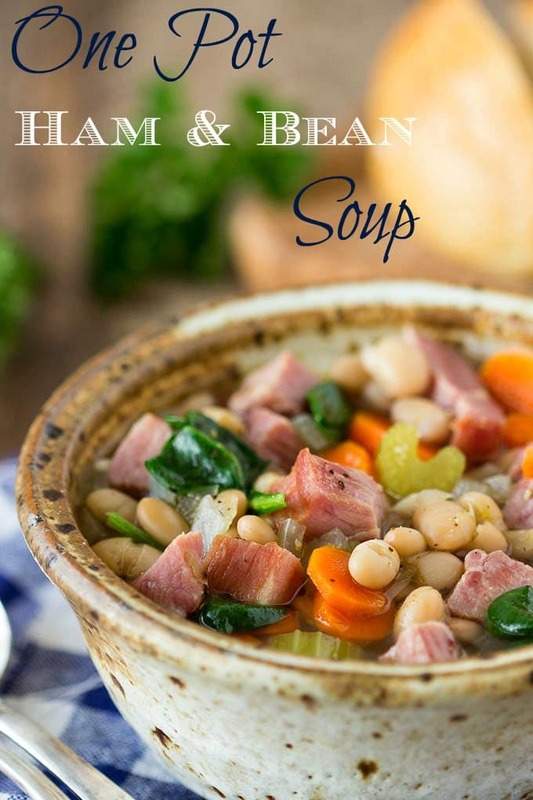 What does snow have to do with Ham & Bean soup? 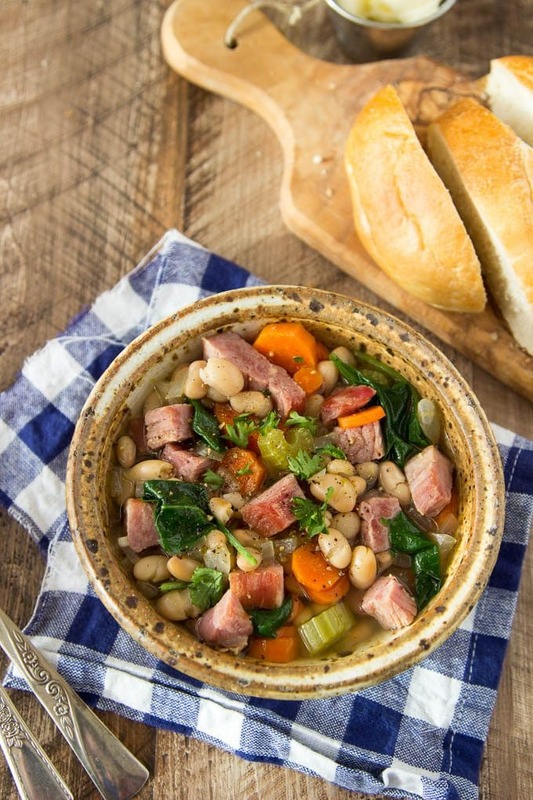 Well..this Ham & Bean soup just happens to be great way to refuel your body after you’ve been out playing in the snow, or really anytime you are looking for a nutritious easy meal. I think we naturally gravitate to hearty warm meals in the winter time, but this soup is just good clean eating, you could enjoy it anytime of the year. This soup is full of all kinds of good things! Fill up without feeling over stuffed. Ham is rich in protein, white beans are full of fiber (to keep you feeling full), and celery, carrots and spinach help sneak in your needed veggies for the day. Seasoned with fennel and sage which just takes this soup to the next level. Ridiculously easy! 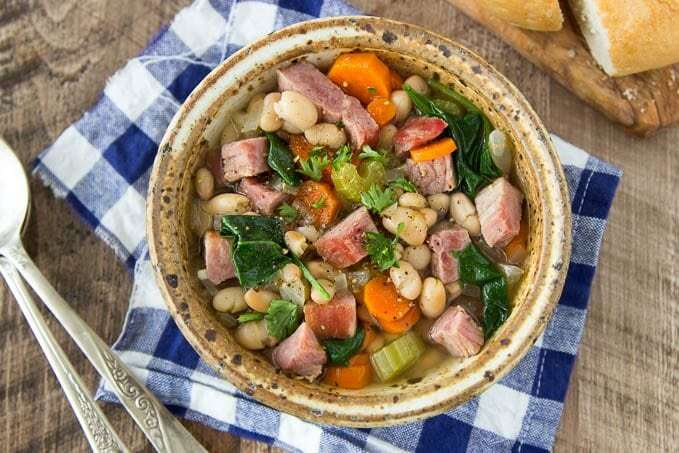 This One Pot Ham & Bean soup is hearty and chock full of favorites like chunks of ham, white beans, carrots, celery and a bit of spinach for some extra veggie power. Heat olive oil in a Dutch oven or large soup pot over medium heat. Add onions and cook for about 3 min (until onions start to become translucent). Add celery, carrots, garlic, sage and fennel and continue to cook for another 1-2 minutes. Reduce heat to low. Add white beans, ham, chicken stock, water and bay leaves. Simmer on low for at least 30 mins. Just before ready to serve, turn off heat, remove bay leaves and add spinach, stirring to mix in spinach. Salt and pepper to taste. (lots of cracked fresh pepper is fantastic!). garnish with fresh parsley if desired. ** I find ham can be a little on the salty side and there are so many variables depending on the seasoning if you are using leftover/store -bought ham , this recipe errors on the lower sodium side. You can add additional salt to your liking.